Recently, a mysterious creature washed up on a beach in Russia. It was a “Sea monster” at least three times larger than an average human. It was covered with Tubular fur which is similar to a fibre optic cable. Let’s dive into the animal world and find out some fascinating creatures on Earth. 1. A relative of the Mongoose, this is the largest carnivore and top predator native to Madagascar. 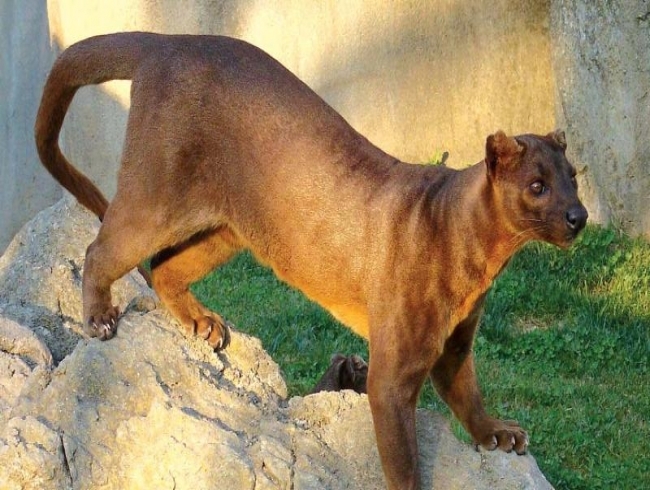 It is a slender-bodied catlike creature, and resembles a dog too. It can wield its tail like a tightrope walker’s pole and move swiftly through the trees that scientists have a trouble researching it. Identify. 2. They have stripes like Zebras, but they are most closely related to Giraffes. It is called the forest Giraffe or forest Zebra, but one of its lesser-known names is the “African Unicorn.” They were so dubbed because, until 1901, many believed the creature was a myth. Identify. 3.This large wild goat lives in mountain ranges from Afghanistan to northern India, but it’s the national animal of Pakistan. Its Persian name translates as “snake eater,” and locals believe the foam they release while chewing cud can extract snakebite venom. Its age can be determined by counting the rings on its horns. Identify. 4. In the Pacific Northwest, fishers are cashing on this; a funny-looking mollusk turned worldwide delicacy. It is native to the waters of western Canada and the northwest United States. Their necks easily stretch from banana to baseball lengths, depending on how happily situated they are. Identify. 5. These monkeys use their fleshy, pendulous noses to attract mates. It creates an echo chamber that amplifies the monkey’s call, impressing females and intimidating rival males. They’ve evolved webbed feet and hands to help them outpace the crocodiles and are one of the fastest swimmers. Identify.